Searching For A Used Lexus In Winnipeg? See local Lexus dealer prices, pictures & monthly payments for financing. 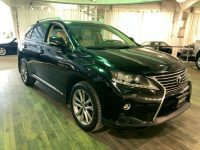 Winnipeg Lexus IS350, RX350, NX200, GX460 suvs and cars for sale to buy. Lexus was introduced in 1989 as a luxury brand targeted at Mercedes-Benz, BMW and Jaguar. If crossovers and SUVS are more you thing, there are also the RX, LX and GX. Find your next car by browsing our extensive used Lexus listings. Our knowledgeable Lexus sales consultants are here to help you research the latest Lexus body styles and go over the detailed model specifications and features with you. Why Buy A Pre-owned Lexus from Nott? Every Nott family certified pre-owned Lexus has undergone a 160° premium check to ensure your vehicle is at its highest standard.